I recently purchased a copy of The Unknown Capablanca by David Hooper and Dale Brandreth, and noticed that Capablanca's first simultaneous exhibition in Chicago took place in 1909, and although Unknown Capablanca has over 200 games; most of which had not been published outside of their original publication, none were from his first exhibition in Chicago. The Jose Raul Capablanca who made his first Chicago appearance on November 24, 1909 was no longer the child prodigy of earlier times, but a graduate of Columbia University, who had won, his first major match, against Frank J. Marshall, quite convincingly with 8 wins, 1 lost game and 14 draws. By the time Capablanca reached Chicago , the young Cuban master had played hundreds of games during his tour. Both the Chicago Tribune and Chicago Daily News provided some coverage of Cubans arrival and stay in the "windy city". "Jose R. Capablanca, the young Cuban chess expert, who stepped into the front rank of the world's chess masters by his overwhelming defeat of Marshall, will give an exhibition of simultaneous chess tonight at the rooms of the Chicago Chess and Checker club in the Schiller building." " He is a rapid player and frequently finishes these simultaneous affairs in half the time taken here. The unusual time taken by the Chicago exhibition is explained by the strength of field against him." Capablanca's easy demeanor and winning personality made him a favorite of the Chicago chess world. "Capablanca made a good impression upon the Chicago chess world by his skill as a player and by his personality. In appearance he is youthful and slender. He looks and acts like a nice, quite college student, which, indeed he is, having recently graduated from Columbia university." Thirty-one local experts faced Capablanca, the young Cuban expert won twenty-five games, lost four games, with two games ending in a draw. 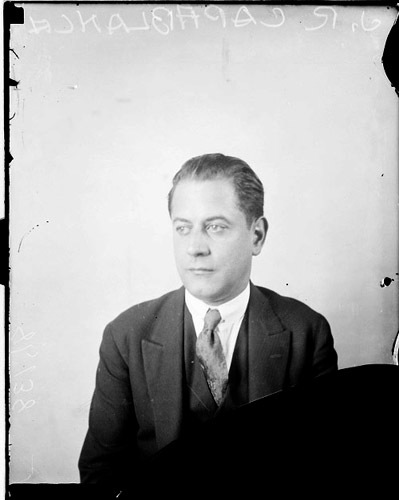 The winners against Capablanca being Oscar Chajes, Charles W. Phillips, F.H. Chase, and Einar Michelsen. Draws were secured by Louis Uedeman and Judge Smith. The Tribune published one game from the exhibition, the win of F. H. Chase over the Cuban expert in it's December 5th chess column. The Chicago Daily News printed four games from the exhibition, Capablanca's wins against Sullivan and Erdeky, and loses to Chajes and Michelsen. "Oscar Chajes was the first one to obtain a victory over the youthful chess master. On his sixteenth move Capablanca made a blunder, an unusual thing for him to do. Chajes took prompt advantage of his opportunity and forced a speedy ending." Just over a to the year to the date Capablanca would return to the "windy city", to give another simultaneous display. Although these five games don't add much to Capablanca's legacy, they are part of Chicago chess history and Capablanca's debut in the "windy city".